If you can remember slim little chocolate bars covered in thin purple foil, if you know what the rag and bone man cried out as he came down your street, if you remember what a smooth old penny felt like, then the arcade at the end of Southport Pier will bring back many memories. And if you don’t, then it will be a magical revelation of quirky delights. For there you will find the The National Museum of Penny Slot Machines. This wonderful Penny Arcade on the North West coast of England, evokes memories of seaside holidays, buckets and spades on the beach, gritty sandwiches, flapping wind breaks and fish and chips after a grand day out. There are over 100 Penny Slot machines including some real gems; its owner by Clive Baker used to display it on Brighton Pier. Inflation means you now pay £1 for ten old pennies, but money can’t buy the fun and nostalgia that this quirky attraction brings to visitors of all ages. One of the most popular attractions is the Blackpool Tram Race where you can bet on which of 6 colourful trams will reach the Tower first. Another favourite is ‘Harry Corbett’s Sooty TV Concert’ where Sooty, Sweep and Sue play ‘The Grand Old Duke of York’ – and all for the price of an old penny. In this era of hi-tech computer games, you may hanker for the thrill of getting 3 cherries in a row on the slot machines; there are plenty to try your luck on. One intriguing machine is the fruit gum dispenser, one of the only ones left in the world that still works; the sweets taste just that bit better because they only cost a ‘penny’. Punch & Judy get a look in, although the show is so quick, blink and you miss it. There are a number of Edwardian ‘Mutascopes’ – also known as ‘What the Butler Saw’; moving films featuring scantily clad ladies in various stages of undress. The plinth was made higher so children couldn’t reach the viewfinder! Steerable ball games, strength tests, spooky haunted graveyards and fortune tellers all draw enthusiastic gamesters. Check out the old football game with teams in original hand-knitted woolly jumpers. There’s a laughing Jolly Jack Sailor to make you smile and brightly painted wooden puppets which perform jerkily charming Tyrolean dances. Southport Pier was originally a glorious Victorian confection built in 1860 and in its heyday was over 4,000 feet long. After fires, collisions and gales it was eventually rebuilt and reopened in 2002, now stretching over a kilometre out across the famous Southport Sands into the Irish Sea. All along the wooden walkway there a name plaques that local people paid for to help raise funds for the restoration of the pier – see if you can spot Ken Dodd’s. 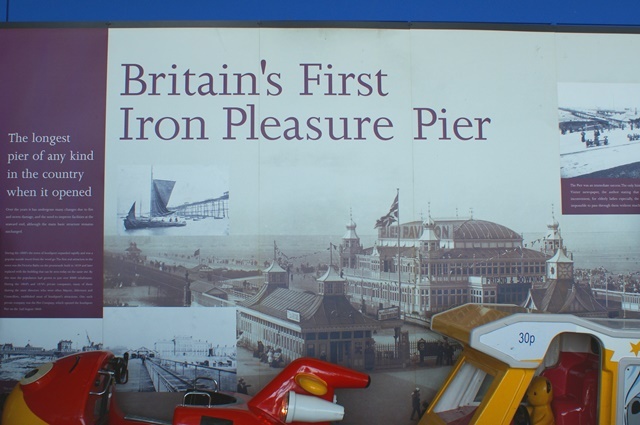 We had one placed in memory of Dad, who loved the pier and introduced us to the pleasures of the penny arcade many years ago. You can take a leisurely walk or catch the tram to the end of the pier, where the modern cafe and arcade attract thousands of visitors from all over the world. For a great escape from the hi-speed modern world of fast connections and electronic gizmos, Southport Pier’s Penny Arcade is just the ticket! Been there myself and it is a unique chance to participate in a bygone world. Nice view and cuppa tea to be had at Southport Pier too. Ah, my grandchildren had to drag me out of that arcade. I just love spinning and flicking those silver balls! But what has happened to the Land of the Little People? Blackpool North Pier now have one of these, complete with Jolly Jack Tar and the Sooty Show Band! Appropriate as it was on that very pier that Harry Corbett first acquired Sooty. Must go and see the Blackpool ones on next visit Barry. We visited yesterday and didn’t see any of the interesting machines shown above. There were mostly fruit machines and penny falls, and the same kind of games you can still see in most arcades. I was very disappointed as it was one of the main reasons for our visit to Southport. Oh no – I took those photos a few weeks before the article was written and can’t imagine why they would have got rid of them as that is the whole point of having the arcade. (It’s the one at the end of the Pier, not the one in front of the Pier by the carousel.) I will go back and check next time I am there. 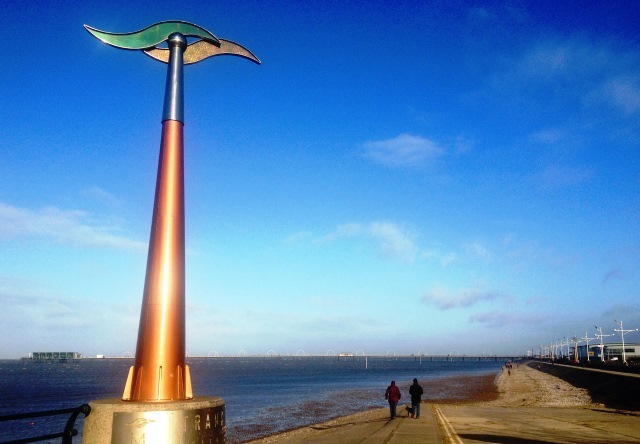 Thanks for finally writing about > Southport Pier: a trip down memory lane < Liked it!